Deck designs can be as simple or complex as the human imagination will allow. Some people prefer a more modest deck, while others want an elite deck design that stands out and has an abundance of attention-grabbing wow factors built in. Wow decks can be accomplished in a variety of different ways, and you can even create one on a more conservative budget. After years of building custom decks in Omaha we’ve learned a few ways to turn ordinary decks into Wow Decks. Let’s go over some options here. If you’re on a tighter budget, some affordable wow factors can be done to get you closer to a wow deck. When you’re on a budget your focus should be on materials vs. layout. 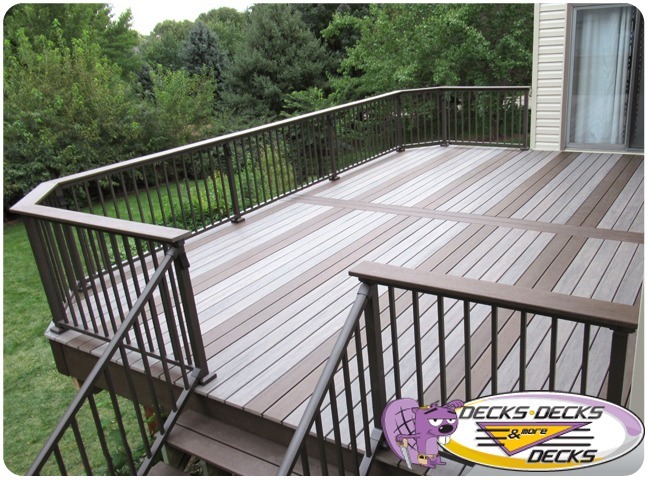 By adjusting a few areas on this TimberTech deck with aluminum rails we were able to make it stand out. A simple flooring pattern adds a unique twist. Flat top rails in order to hold your drinks or plants are easy enough. Beveled front corners of the deck vs. traditional square 90 degrees. Simple can have just as much “wow” factor. If your vision has no budget restrictions you can create a Wow Deck with multiple tiers/levels, dedicated spaces, or exotic staircases. Dramatic, multi-level decks help define spaces into distinct, usable areas. Enjoy your view with built-in elevated seating, or step down into a hot tub and lounge area. Including built-in lighting on your staircase brings it to life in a magical and functional way. These ideas are just the tip of the iceberg when it comes to making your deck a Wow Deck. Drop by our showroom, and we can show you person all of the options available that will fit your budget and will work seamlessly with your home. This entry was posted in Custom Decks Omaha and tagged custom decks omaha, deck building omaha, Deck Building Tips, Deck Ideas, decks omaha on November 29, 2018 by Decks, Decks and More Decks.